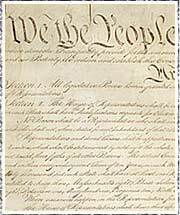 The U.S. Constitution, Article 1. Section 2. The "Three-Fifths Clause"
Although the Constitution did not refer directly to slaves, it did not ignore them entirely. Article one, section two of the Constitution of the United States declared that any person who was not free would be counted as three-fifths of a free individual for the purposes of determining congressional representation. The "Three-Fifths Clause" thus increased the political power of slaveholding states. It did not, however, make any attempt to ensure that the interests of slaves would be represented in the government.